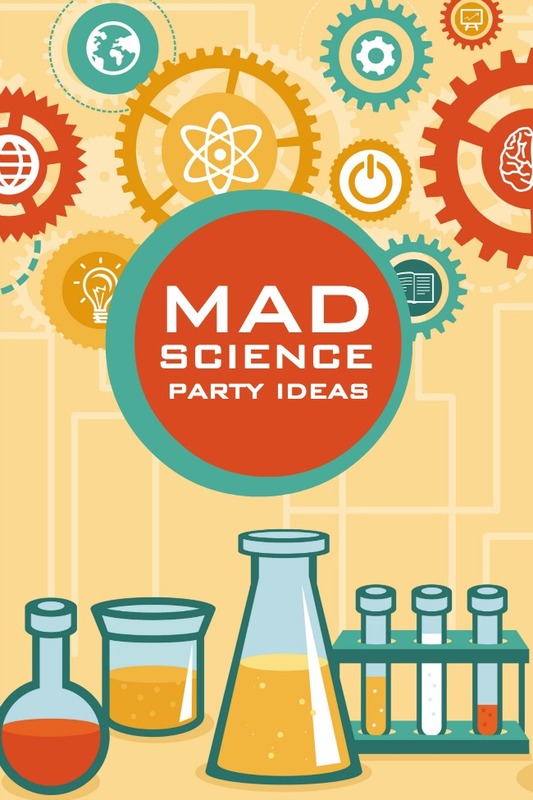 As a former science teacher, the idea of a mad science party is SO fun to me! It’s definitely a theme I’d like to do with my boys as they get a little older. In fact, when I taught Jr. High science, I used to do a Mad Scientist day for Halloween each year. It was so much fun. So, I’m thrilled today to have a great party planning blogger here today sharing some fun ideas for throwing a great mad science themed party!!…. Did you know exploding experiments and oozing goo mix well with birthday cake? They do if you host a mad scientist birthday party! Add safety goggles and lab coats and you’ve invented an invitation for fun. Moms realize Mad Scientist antics are really savvy academics but the kids just know they’re having an awesome good time. Read on if you’re interested in learning how to mix up your own party formula! Since the image of a mad scientist stereotypically includes a white lab coat, over-sized glasses, a bow-tie, and disheveled hair, include some of those elements for grins. Kids love to dress up in costume pieces! Over-sized white t-shirts, cut up the front, can stand in for a credible lab coat. Remove the lens from dollar store glasses or use safety goggles. Clipboards and identification cards on lanyards complete the look; use these pieces for take-home favors, too. The word “science” includes a huge variety of potential to feature for your party décor. Do you want to focus on space, the human body, the underwater world, flora, fauna, etc.? Depending on your choice, decorations can go from sterile black and white to explosions of color. If you opt to create a faux laboratory, add bright hits of color, such as acid green or yellow, to keep it lookingparty ready. Use a focal point in your decorations with a copy of a periodic table or a chalkboard scribed with formulas. Add pictures of whatever field of study you are featuring. Beakers, test tubes and microscopes all add authenticity. Label your party food with scientific jargon, too. Include terms like atoms, molecules, ions, quantum and electrons. Use a few beakers and petri dishes for food display. Test tubes are great for holding small candies. Wrap water bottles with “formula” labels. Use a sharpie to mark measurement lines on clear, plastic cups and they’ll look like beakers…or specimen cups! Most kids are curious and imaginative. Amplify those traits with the fun ideas found in a Mad Scientist themed birthday party and…you might encourage another Albert Einstein! Stephanie Keeping is a wife to Mike, mom to Sam, a blogger, and an Etsy-preneur. She celebrates boyish charm at Spaceships and Laser Beams, where she talks about all things boy and birthday party. You can connect with her on Facebook, Google+, Pinterest,Twitter and on Etsy. Thanks, Stephanie!!! 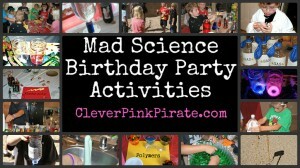 For even more fun ideas, be sure to head over to Clever Pink Pirate’s Mad Science Party. The lab coat and a few other supplies were mine. So, it was extra fun to see what she did with everything! We did more than one science themed birthday party and they were big hits! Experiments we did included cabbage juice pH indicator (use plastic test tubes and pipettes to really look authentic), Coke/mentos fountain (diet works best), baking soda and vinegar reaction “lava” cake, and gum drop and toothpick “molecules.” We also did film canister rockets, but I’m not sure what you use in place of film canisters these days. You could find them even 10 years ago, but I’m not sure if you could now. I found that safety goggles/glasses were inexpensive and great party favors along with a test tube and pipette.